AS SEEN ON ABC, CBS, NBC AND FOX, THESE HIGH-QUALITY PRUNING SHEARS ARE THE LAST ONES YOU'LL NEED TO BUY! 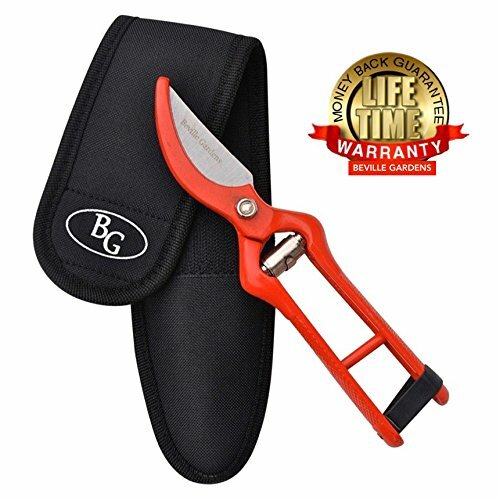 Get The Best 8" Bypass Pruning Garden Shears For Easier Clipping and Trimming by Hand - with Bonus Holster. Make Your Gardening Easier and More Enjoyable Now! - Do your hands ache from an uncomfortable grip and weak spring action? - Do you wish your pruning scissors would cut smoother? - Do your garden pruning shears not close securely? - Did your locking mechanism twist out of shape or break off? - Do you waste time searching for your pruner amid the greenery? Then it's time for you to experience the difference of Beville Gardens pruning shears! Introducing Our Professional, Heavy Duty, Extra Rugged, Sharp and Reliable Garden Pruning Shear, Clipper and Trimmer! Our shears are backed by a full Lifetime Warranty! CLICK THE ADD TO CART BUTTON NOW! YOU'LL BE GLAD YOU DID! ✔ SPRING SALE! These high-quality pruning shears are the last ones you'll need to buy. SAVE TODAY on these Professional HIGH CAPACITY Pruners! Cleanly TRIM BRANCHES up to ¾" and stems of all types. Only on Amazon! ✔ EVER-SHARP, STRONG, INDESTRUCTIBLE BLADE: Our 8-inch forged steel bypass garden shears are sharp and stay that way! The beautiful BRIGHT COLOR is EASY TO FIND so you don't lose them. The "MUST HAVE" tool for all landscapers, florists, crafters and homeowners. GET YOURS NOW! ✔ COMFORTABLE NON-SLIP GRIP: Perfect for small and large hands; left-handed or right, ensures hours of no-strain gardening! Whether you're caring for roses, tulips, carnations, bougainvillea, shrubs or even trees, YOU'LL LOVE THESE PRUNERS! ✔ ADVANCED TENSION SPRING: Long-lasting spring design for a consistent rebound. Forget about pruners with latches that jam. Our closure system is failure-proof....and you get a FREE HOLSTER too. Click the ADD TO CART BUTTON NOW! ✔ 100% MONEY BACK GUARANTEE and LIFETIME WARRANTY: Love our shears or get your money back! Every gardener needs top-quality tools like a spade, rake, hoe, shovel, loppers and saw. But owning the best quality pruners is essential, and makes a great gift, even if it's to yourself! GET YOURS TODAY! Click the ADD TO CART Button! You'll be glad you did! If you have any questions about this product by Beville Gardens, contact us by completing and submitting the form below. If you are looking for a specif part number, please include it with your message.